Apple has rolled out a new ‘Get ready for pre-order’ feature page for iPhone 6s and iPhone 6s Plus that aims to provide consumers with information that could significantly streamline the pre-release purchase process. It’s fair to say that the majority of consumers appreciate the ability to be able to pre-order any new iPhone. Rather than be faced with the manic rush that comes associated with queuing up for the device on launch day, or playing the website lottery and trying to order one when it launches before stock is depleted, being able to pre-order often removes a lot of the uncertainty. With that said, even the pre-order process can be confusing to some users, hence the new feature which could remove some of the frustration. 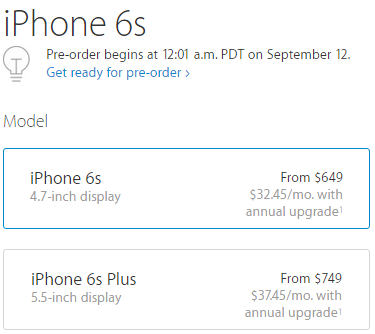 The handy little website feature first of all confirms that the iPhone 6s and 6s Plus will both be available for pre-order beginning 12:01 am PDT on September 12. It continues to outline the fact that when purchasing an iPhone consumers are expected to provide a little additional information in advance about their network carrier account that will be associated with the new purchase. The ‘Get ready now’ wizard embedded within this feature walks the user through a few simple steps that are designed to collect information about the users carrier account, which is then used to determine upgrade eligibility and whether or not any discounts are possible. Apple is also using the little feature to promote the official Apple Store app, which it still professes is “the best way to buy iPhone”. Interacting with the ‘Get ready to pre-order iPhone 6s’ within the Apple Store app, and making sure the ‘Remember Me’ option is selected, will not only store the wireless account details, but will also save time during the order process and potentially let a user get a device that they may have otherwise missed out on. The existence of this feature has clearly been born out of the frustration that a number of users have experienced and expressed over the last few years when trying to pre-order an iPhone. Apple is hoping to break records once again with the 6s and 6s Plus so it makes perfect sense that it’s doing everything it can to get the hardware in as many hands as possible at the earliest. 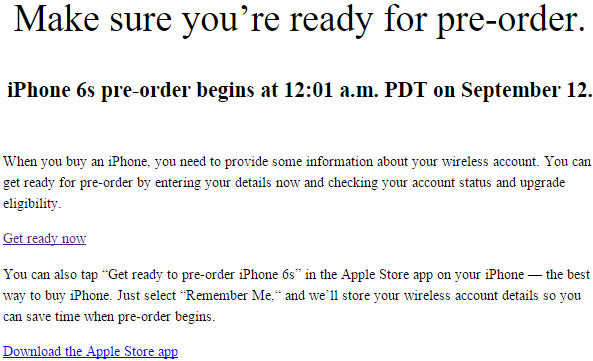 To get started, visit Apple’s official ‘Get ready for pre-order’ page here. 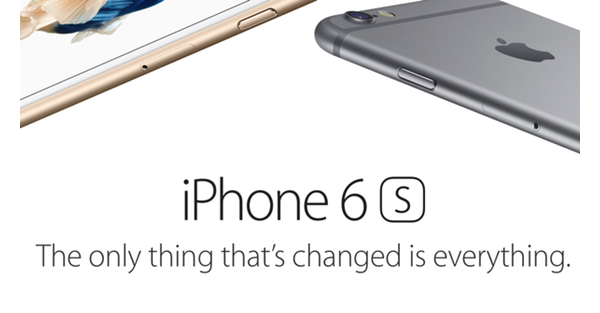 What about a contract-free unlocked iPhone 6s?